Winamp Media Player and all its Services is Shutting Down on Dec 2013! Winamp Media Player is Shutting Down! 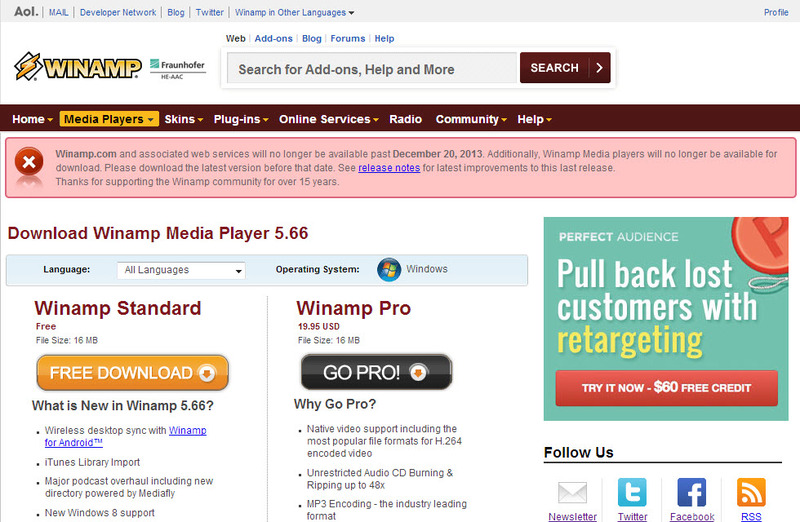 Winamp media player is shutting down all it’s services, which include winamp.com domain, Web services and software. If you are using computer during xp era, then I’m sure you will be aware of winamp player. Which is one of the most popular player to play our mp3 songs on those days. I still remember those days when winamp is the one player which I and my friends were used to play songs. Which is having dark color skin, light weight player and drag and dropping songs to player… it is remembering my college days. It is really fun to use that software. Day by day winamp starts loosing it’s charm and popularity because of lot of other music players dominated winamp over it’s features. Example: VLC player and few other. After surviving 15 years in the industry, now they announced that they will completely shout down all winamp service. They not even posted this news on their official blog. They simply displaying this breaking news on small announcement on their homepage. There are still few users using this player as their main player to play music. After this announcement they are sad about this move by AOL. Winamp is created by the company called Nullsoft after it is acquired by AOL. If you are still winamp user or want to try winamp latest version then download latest version before December 20, 2013. After that you cannot able to access that software from official source. Currently the latest version of winamp media player is 5.66 and you can download that player here before they shutdown or you can download it from filehippo even after they shutdown.